"I was thinking about getting rid of the van." "Hold that thought, Dad. I think I want it." 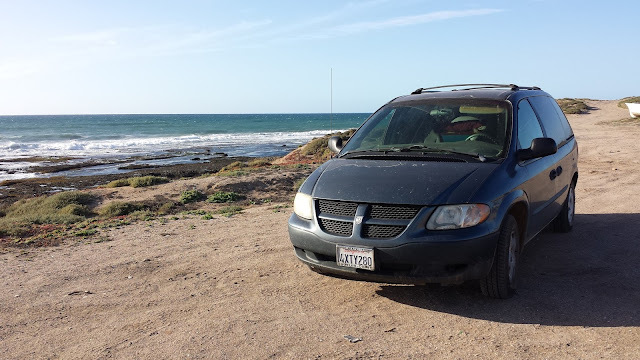 On a Tuesday in 2002, my mom bought a blue Dodge Caravan. She named it "Ruby," as in "Ruby Tuesday," and we adorned the back license plate with a pink-rhinestone-studded frame. She mostly drove it around town for errands, so it remained a low mileage vehicle in impeccable shape. 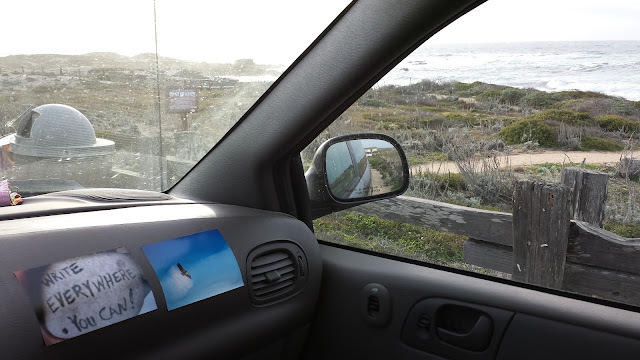 After she passed away in 2013, my dad took the van on one very long road trip across Canada and the U.S., but otherwise also mostly did not use it. He had another car and didn't really need it any more. 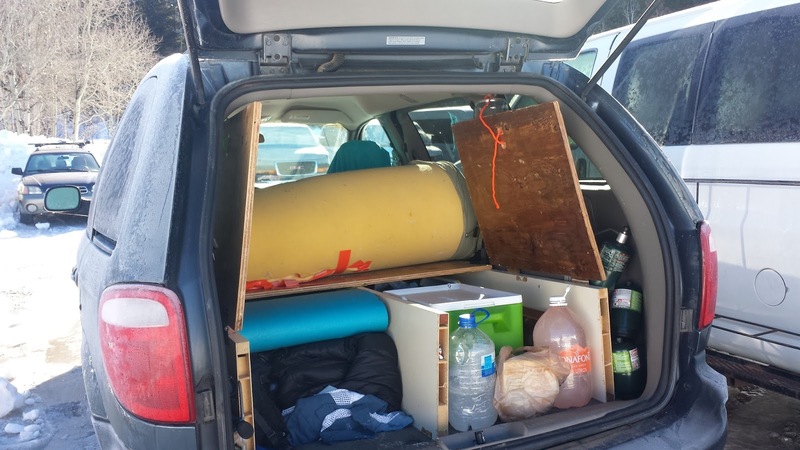 Over my time living in Yosemite, I had become quite familiar with folks outfitting vans into mini-mobile homes. (Or, as I prefer, "caR-V.") They're quite popular among the dirtbag climber set. Driving through Tuolumne or along El Cap Meadow, I'd see folks drinking coffee or cooking breakfast, their bed platforms visible through an open door. Several of my friends had variations on this theme, and I had slept in an Astrovan, waited out a storm in a Honda Odyssey, eaten dinner in a Sprinter van, and rode around Joshua Tree on a cramped but comfy platform of a Tacoma truck. 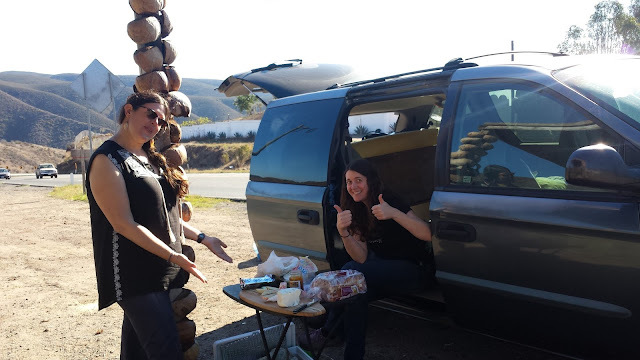 Then, I went to New Zealand, where campervans are the transport of choice for travelers. 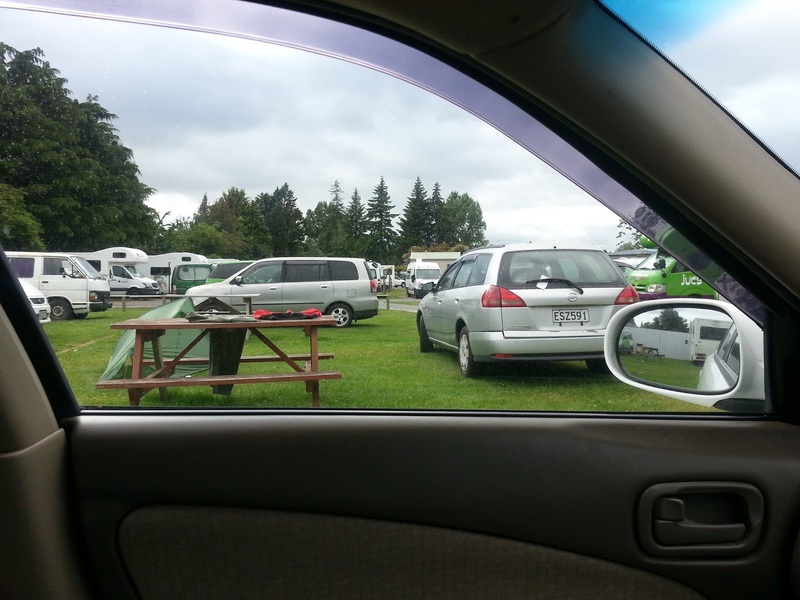 The Kiwis have taken campervans to a whole new level, and I enjoyed peering inside folks' rigs as I walked around campgrounds. How many campervans can you spot in this picture? When I started scheming my escape from the working world, I contemplated a road trip through the West to visit my many far-flung friends. 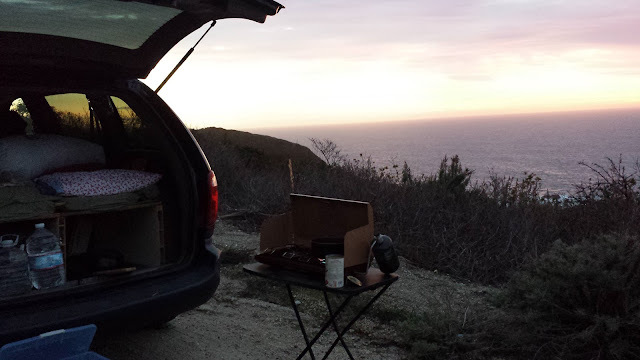 I became enamored with the idea of #vanlife. 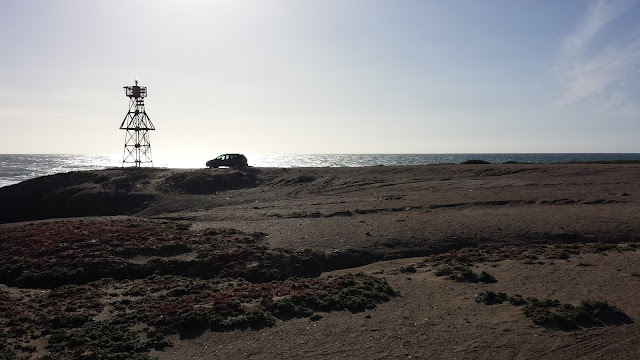 Last summer, I started van research in earnest. I would walk up to random strangers in Tuolumne Meadows and ask to see their van interior. ("No, really, I'm just interested in the van. I mean, you're cute, but I just want to see the van right now." 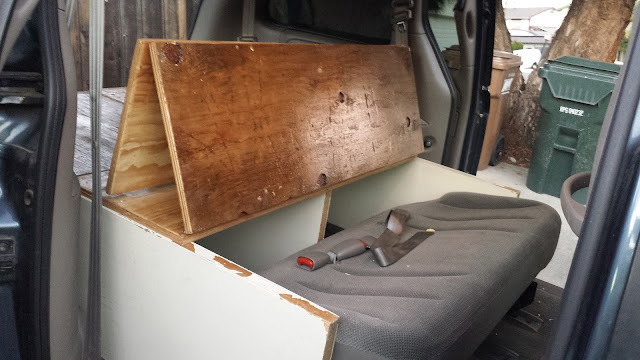 =P) I began serial-watching YouTube videos, perusing van blogs, and obsessively Googling things like, "bed platform storage" and "dodge caravan build-out." Along the way, I finally figured out the purpose of Pinterest and started linking ideas and photos to a board there. I began cutting out bits of construction paper to represent mock-ups of platform set-ups. 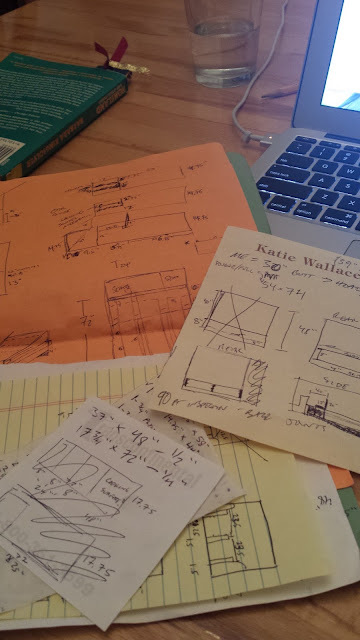 I stayed up way too late dusting off my geometry skills and drawing up blueprints for a number of design ideas. Pythagorean theorem IS useful, after all! As my plans started to shift from a leaf-peeping fall road trip to an icy winter road trip, I knew I would not likely be sleeping in the van nearly as many nights as originally planned. However, I couldn't help myself - I was too entranced by the design and construction to turn back now. As many "upcycled" (salvage) materials as possible. This is in alignment with my general modus operandi as a stalwart environmentalist, and would have the added benefit of keeping costs low. 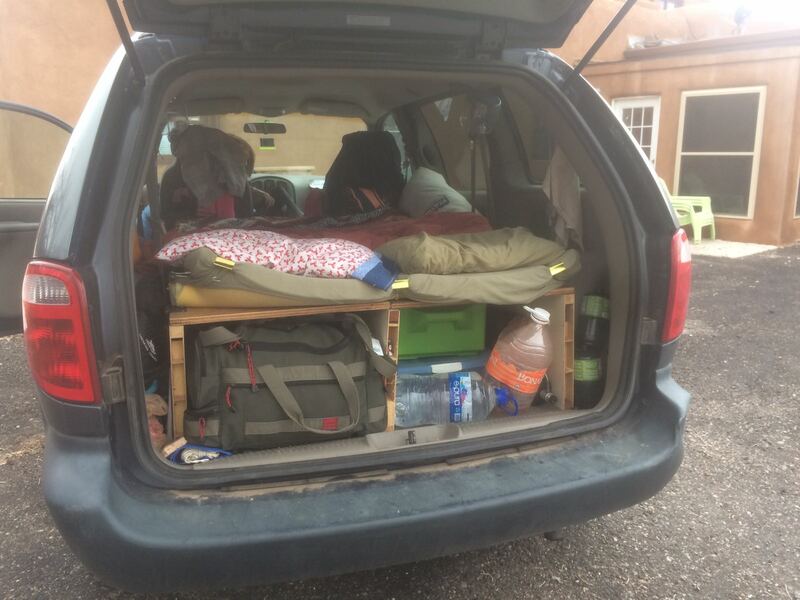 Enough storage to accommodate skis, winter clothing, backpacking gear, a double-burner cook stove, and other assorted gear items. A pull-out storage drawer that could be converted into a cooking counter. Inside access to my clothing storage. 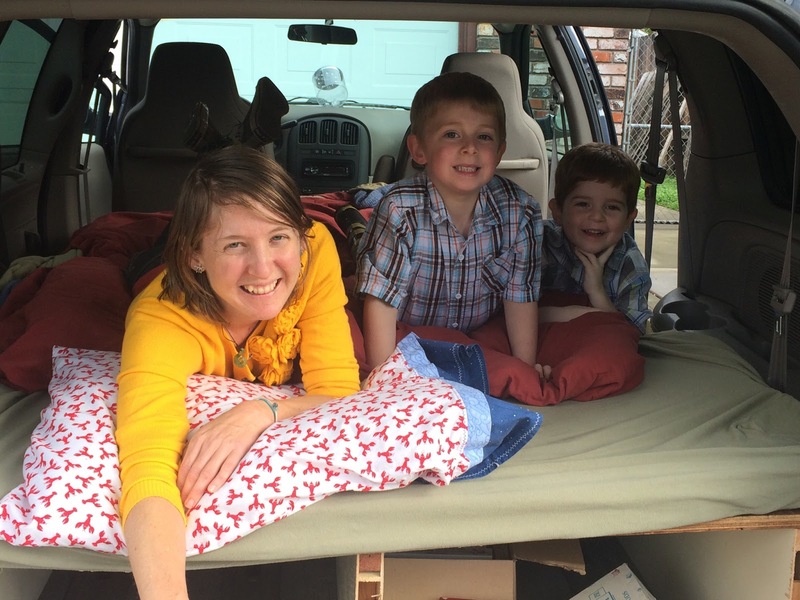 I wanted to be able to change out of my sleeping clothes without getting out of the van and opening up the rear hatch. A double bed. Life is more fun with a friend. Sleeping is also more fun when you can spread out. The ability to sit up in bed. I wanted to be able to sit up and read while in bed and not feel like I was jammed into a coffin. There are a lot of designs, especially in truck beds, that forego the ability to sit-up in favor of more storage beneath. Since I'm relatively short, I figured I could probably find a happy medium between storage and "air space." A convertible couch that would double as a hang-out space and would have legal/safe seat belts to be able to carry more than one passenger at a time. 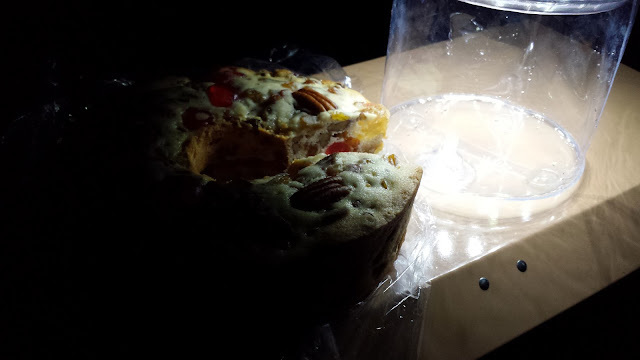 Solar Luci lights for hangout time in the evenings, sans headlamps. Eco-foil window coverings for stealth camping in urban areas, as well as privacy. Curtains are a sure "tell" that you are living in your van and I didn't want to attract any undue attention to my rig. A small cooler. I wanted it to be big enough to hold a couple of beers, some dairy products, and some vegetables, but not so big that it would be bulky or heavy or require tons of ice and drainage all the time. Though I investigated options like propane heaters, solar electricity systems, and generators, I decided to keep the design simple for my first go-around. In the end, I carried out all of my design implements, except the slide-out drawer/kitchen counter top. I used old accordion door pieces for the main "struts" of the bed platform. 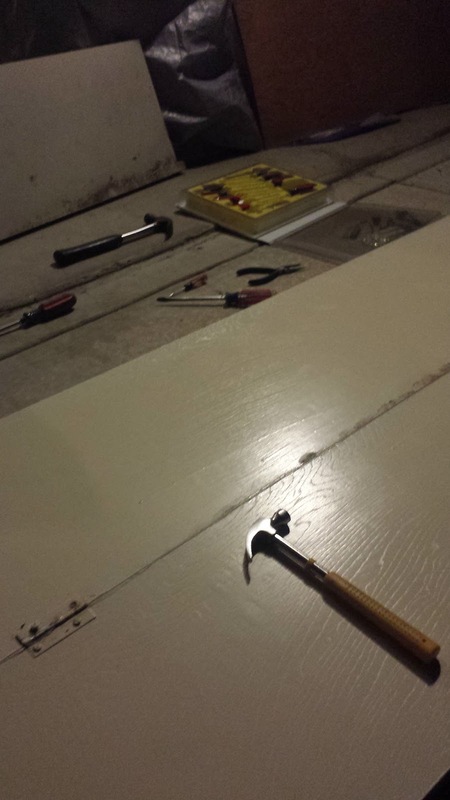 This was courtesy of my friends Ryan and Laura, who had just moved into a new house and had remodeled their closets. 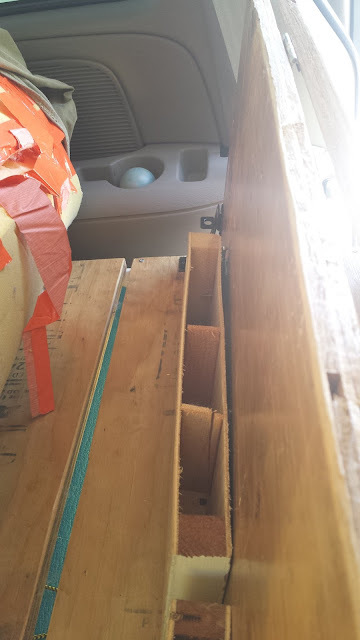 The wood is hollow in its core, so I couldn't drill drawer slides along its length with enough stability to hold a drawer's weight. I had originally wanted one side of my storage to have a drawer and the other side to have a flap accessible from inside, but instead, I went with two flaps. Though not quite as convenient as a drawer, this was a pretty good compromise. I can cook directly on the bed platform itself (with the mattress rolled back) or on a nifty fold-up table that Ryan generously donated to my travels. Thanks, Ryan! Cooking with a view in Big Sur, courtesy of my fold-out table. 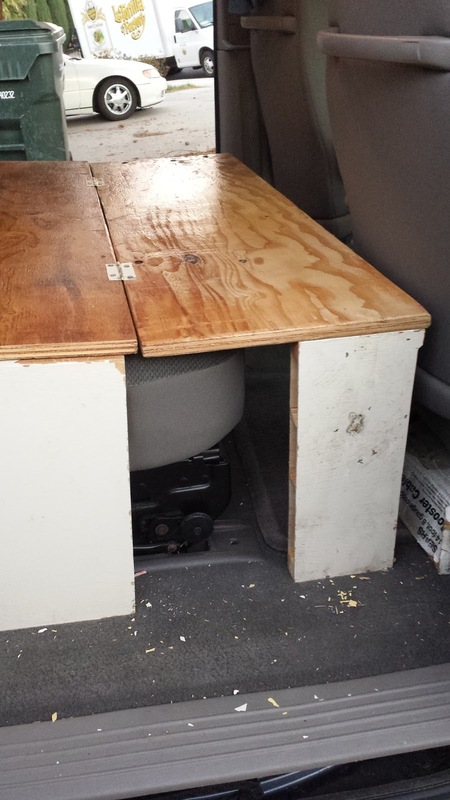 Also, although I cut out window coverings as planned, I found them to take up an unreasonable amount of space in the van. The van has 8(!) huge windows, so even when rolled up, they are quite large. Since I have tinted windows and do mostly remote camping rather than urban stealth camping, I found them to be a bigger hassle than they were worth. I will probably get rid of them. I'm still thinking about making some curtains for privacy and general coziness. The finished bed platform, viewed from the right side door. 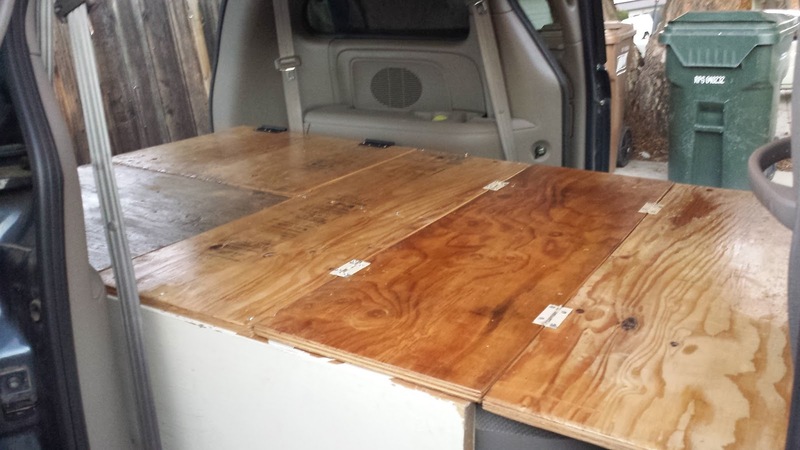 All salvage wood, mostly salvage hinges and screws. Finished bed platform, viewed from rear. View from rear, with back storage flaps up. This allows me to more easily access storage from the inside, or, when the hatch is open, to access the back nooks and crannies of the platform. The flaps are secured in the "up position" with plastic-coated adjustable ties fastened to the coat hanger latches. We removed the two-person seat and moved the three-person seat to the front for maximum passenger and couch space. 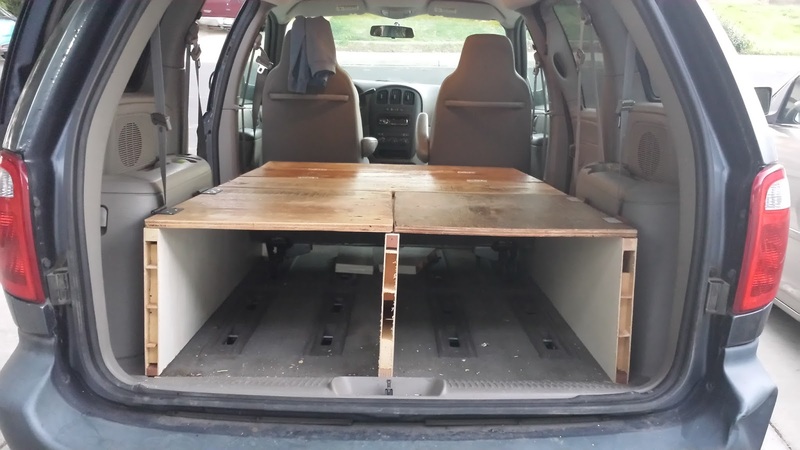 We removed the van seat-back because even when it was folded forward, it would have made the bed platform too high. Newer Caravan models have seats that fold into the floor, which would be a fun design to play with in the future. The seat belts are still legal and safe! After folding back, the wooden seat-back is kept in place with simple gate hinges on either side. Wooden seat-back, viewed from rear. 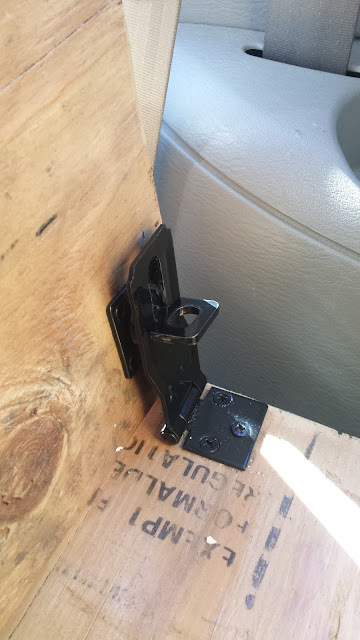 Simple gate latch mechanism to secure the seat-back in place. Rear of wooden seat-back, viewed from above. Legs folded in, gate latch secured. A Luci solar lantern. And fruitcake. Just 'cause. Bed platform with memory foam mattress pad, linens, and the next generation of dirtbags. All moved in. The lime green box is my tiny cooler. The fitted sheet is clipped to my mattress pad with binder clips for ease of rolling the pad up to access the couch and rear storage flaps. Maya pointed me to toward your blog after I mentioned I was contemplating #vanlife. Currently my desk is a pile of similar post-it scratchings and sketchings on my dream van layout! (I'll be flipping my Honda element). It will be good to follow your journey to see what I can learn. Thanks for sharing.